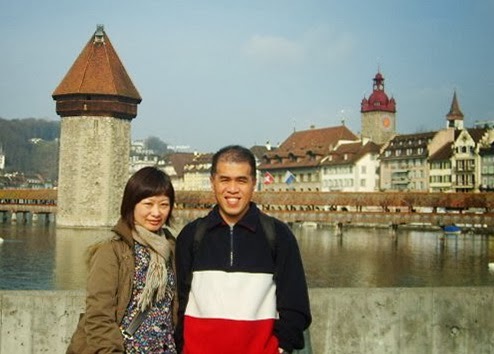 One such memory was made in the spring of '08 when Oi Len and I were in the supremely-charming city of Lucerne in Switzerland. Like many travel tales, there's nothing remotely dramatic about this one. 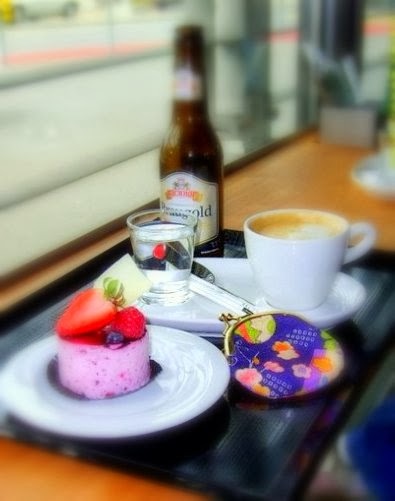 It took place over coffee at the quiet, polished World Cafe at KKL Luzern, the city's cultural and convention centre. We'd just taken our seats by the window; Oi Len ordered a latte and I an ice-cold bitter. From within the refrigerated display behind us, the most divine-looking piece of red/pink strawberry cake was screaming for our attention. The flesh was weak; we succumbed to the temptation. Eine bitte. It had been a long day of sightseeing on Lake Lucerne, and the beer went down particularly well - likewise the coffee and cake. This, however, isn't a review of how glorious the coffee and cake were (which, to be fair, was indeed the case). This is about sharing with you the sheer magic of that moment after we'd taken that first sip; that moment in time when we finally leaned against our high stools... aaaaaah... and immersed ourselves into everything that was happening around us. Almost immediately, it felt as if time slowed to a crawl; everything around us just seemed to suddenly decelerate. Literally. It was late-afternoon Sunday and road traffic was understandably light. Having said that, this is Lucerne. Here, you'll be hard-pressed to not find, wherever you looked, big holiday coaches busing in hordes of rowdy Chinese tourists hell-bent on making their presence known as they willfully flash their expensive Rolexes and Fendi bags. Not today. Today there was little more than a couple of grey pigeons pecking at food crumbs on the street outside, the occasional fit-looking canine being walked by its fit-looking owner (who walks who, one wonders), the motivated municipal worker taking obvious pride in keeping "his" street clean or the young, fuzzy-haired aspiring artist across the street struggling to hail down a bus with canvas in one hand and well-worn palettes in the other. Poor thing. Even the cafe was uncharacteristically empty save for a handful of diners. And of course there was Ella Fitzgerald serenading us. The moment was surreal. No, make that dream-like. Here we were snugly sat by a cafe window in one of the most beautiful cities on earth, 6,000 miles from reality drinking coffee and watching the world go by in near-slow motion. Good food in the company of a loved one, an atmospheric drizzle outside and a heartwarming feeling within - bliss; I wouldn't exchange that for anything in the world. After all, aren't these the little things that make Life's little moments special? Moments such at these. I didn't want it to end. What is your fondest travel memory? Do share. You made that sound lovely....I was right there with you! I'm glad, Kay Dee. That's exactly what I wanted to do; share the feeling with my readers. Thank you for your feedback. When booking with a corporate travel specialist, the vast majority of the circumstances plan changes should be possible at zero or negligible additional charges. This is a really best place to visit thanks for sharing this amazing and wonderful tour memories with us, Great post keep sharing, and also visit agra city with same day agra tour package. Very nicely written post...Thanks for sharing a great information and informative post!! Experience the royal ambiance at best budget hotels, one such place is Business Hotels In Agra, having affordable and well maintained rooms. All tasks involving in your shifting process are tedious and hectic. In fact, it is a very big issue to shift your home or office to a new destination. It should not be taken in easy way. You have to well plan about it. Otherwise you may have to face several problems in your shifting. To get rid of these problems or shift your home or office to a new destination in more and more easy way, you can hire the full services of a renowned Bharat Packers And Movers Dhayari Pune companies. Wonderful memories of Travel, thanks for sharing your personal experience of travel with us. Great guide keeps sharing. Good guide for travellers, thanks for sharing this information with us. Finding the right place to stay can be the difference between a fantasy vacation and a travelling nightmare. Going to bed and waking up in a pleasant setting can change your whole Tour Travel Hotels of your day and everything around you. When spending a vacation in a different country, many larger hotels will be the easiest to find and make reservations with, particularly in popular tourist destinations like Paris or Rome. What an excellent post. I read your article. You write a very good post with beautiful pictures. Many people enjoy travelling and will always do so at any available opportunity. Some people movers aundh often because it is part of their job requirements. There are those who rarely travel but will gladly do so once in awhile especially during vacations. Are you trying to find cheap airline check here If so, you're in the right place. Here you will find tricks how to find the flight schedules you need and best air travel deals, when and where to look and how to search for low cost flight tickets.